As we approach graduation with my child with autism, I am able to reflect back on our journey. What an amazing journey it has been these last 10 years. I have seen my child blossom before my eyes with the knowledge that I had a hand in his success. We pulled Logan out of school at the end of the 2nd grade. It had become apparent that the school was not able to serve his needs without us spending inordinate amounts of time enforcing the agreed upon services. Logan was ahead in some subjects but behind in others like writing. He was having a hard time keeping up with his peers socially as well. We were heading towards disaster at an alarming rate. At this point I figured I couldn’t do any worse. Logan’s Relationship Development Intervention (RDI) therapist at the time recommended we take some time off from any academics in an effort to allow him to decompress from the demands of school. Logan responded so well that we ended up taking two complete years off from anything school related. We did not pick academics back up again until his little sister started kindergarten. Knowing those three key pieces of information helped me tailor his curriculum to his needs. I quickly discovered that he liked textbooks. He liked them as long as he could move at his own pace. He liked learning the facts that were in black and white. He did not like the science labs or anything creative. The unpredictability of those subjects gave him great anxiety. What we ended up with was a hodgepodge of sorts. Fifth grade math, kindergarten writing, 8th grade reading were all in the mix. Going to conferences to look at curriculum before buying it as well as getting references made this task easier as well. Every year I would make a plan of things that we would study then look for curriculum to fit his level. Because I was not using a whole curriculum but a hodgepodge of sorts, it was easier to stop something that wasn’t working to regroup to something else. Knowing his strengths and weaknesses as well as his developmental level allowed me to tailor his curriculum to his needs. This information remained crucial throughout all of his homeschooling years. Why was this successful? Knowing that the unpredictability of science labs and creative things gave me reason to start him at a level below what I knew he was capable of handling. Those subjects needed me to build his competence not his intellect. I needed him to trust me as his educational guide. By building his trust in those areas, I was able to push him just outside his comfort zone in others. 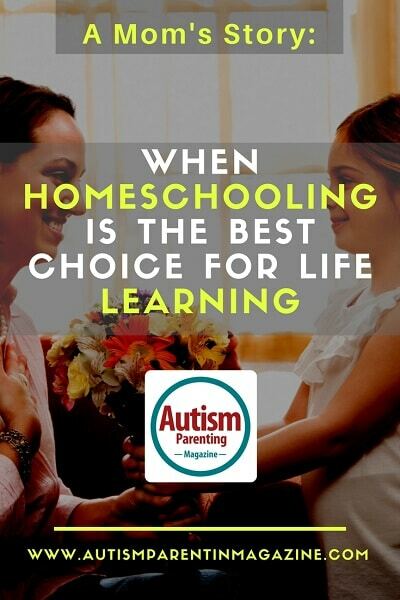 Success in homeschooling meant different things at different times during our school years. When we first started, it was about building trust in him with me as his educational guide. It wasn’t about academics at that point. Play is a great educational tool in these years. As trust was built, academics could move to more prominence. Each success built upon the former allowing us to move on to something harder. Progress was excruciatingly slow at times. There were days that I wanted to throw in the towel. There were months that public school looked like an easier option. I never doubted that homeschooling was the best option for Logan. I just never realized how much work it would be. As I approach the end I can say without hesitation, it was all worth it. Penny is a Jesus filled, Disney loving , homeschool mom of three living gluten free in sunny Florida. She utilizes the Charlotte Mason approach mixed with lots of field trips as well as jaunts to Walt Disney World for her homeschool. She shares her crazy adventures navigating the world with her son with autism.